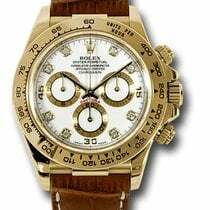 Reference 116518 is a strap Daytona. Some people will say it is a sports watch. Others will call it an elegant watch that is sporty. No matter what opinion you have, this is one of these ageless designs that are at the top of most any watch aficionados list. 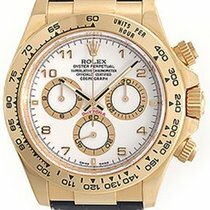 This particular watch is a beauty! Gently worn and well taken care of, it is in excellent collector's shape. This watch was NEVER POLISHED, The bezel is crisp. The calf skin strap is a 9 out of 10. The watch is in perfect mechanical condition, complete with the original Wooden box, owner's manual and certificate.